View more presentations from robby remmerie. View more presentations from Board of Innovation (BOI). HTML5 Mobile Apps With Ruby Code? Interesting interview with Ryan Singer who works at 37signals. He gave this interview after he did a talk at the ‘future of web apps’ conference earlier this year. The one thing thats I think is really interesting is that 37signals is working on a new way of making mobile phone apps with HTML5. They don’t like the way how they are building mobile apps right now. Ryan Singer at Future of Web Apps, London 2010 from Ryan Singer on Vimeo. 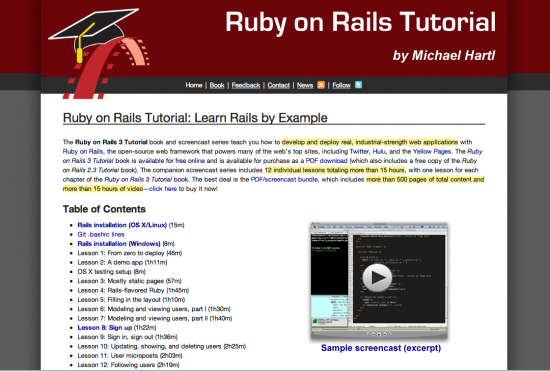 Some quick tips on how to learn Ruby on Rails. If you want to learn Rails first you need to know a bit about programming in general. Chris Pine learns you all the basic things about programming in the Ruby language. He explains things like Array’s, Strings, Hashes and if else statements are. I highly recommend to start with this ruby tutorial. 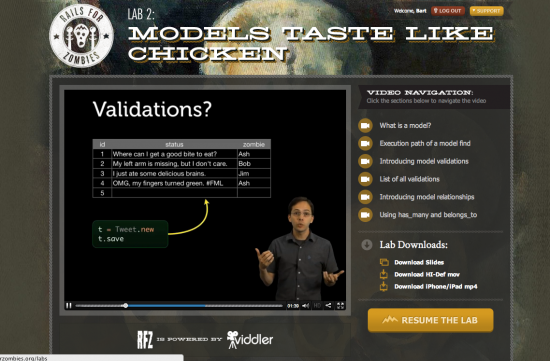 This way you have a good basic set of skills to make you a good Rails programmer. You can buy his book Learn to Program or you can do the tutorial on his website. Rails for Zombies is a pretty easy and good solution if you want to learn the basics of Ruby on Rails. You dont need to install anything on your computer just watch the video and do some exercises in the browser afterwards. 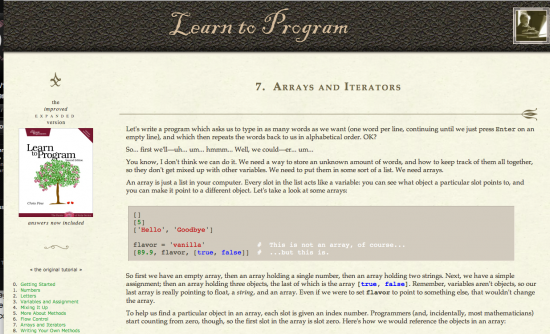 The first two tips are about learning ruby and getting started with rails. Railstutorial.org explains the whole process of building an application in Rails. It starts with installing the right version of ruby and rails on your computer so you can get an app running locally. In the tutorial they are going to make a demo application that looks like twitter. While making the application they learn you how to programme in Ruby on Rails. Railstutorial.org is the best way to learn Ruby on Rails. The website explains the whole process of building a website in rails. Step by step they explain the nature of a rails app, how to work with git, understanding Model View Controller and Test Driven Development. You can read the book online for free or buy the pdf for 39 Dollar. Marc-André Cournoyer is a coder from Montréal who made his own programming language. Why? Why not! Download a sample here and buy the book and the screencast over here. 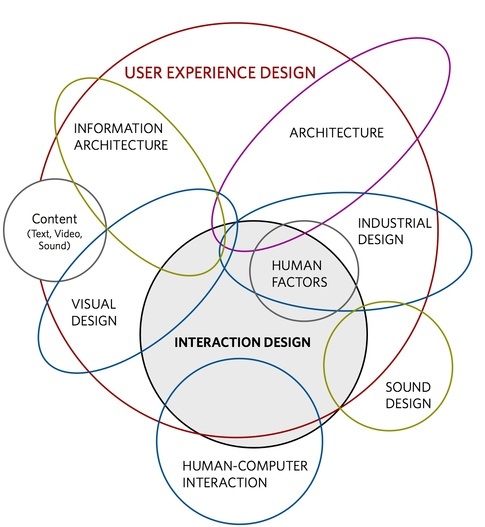 The system will walk you through each step of language-building. Each section of the book will introduce a new concept and then apply its principles to a language that we’ll build together. All technical chapters end with a Do It Yourself section that suggest some language-extending exercises. You’ll find solutions to those at the end of this book. Our language will be dynamic and very similar to Ruby and Python. All of the code will be in Ruby, but I’ve put lots of attention to keep the code as simple as possible so that you can understand what’s happening even if you don’t know Ruby. The focus of this book is not on how to build a production-ready language. 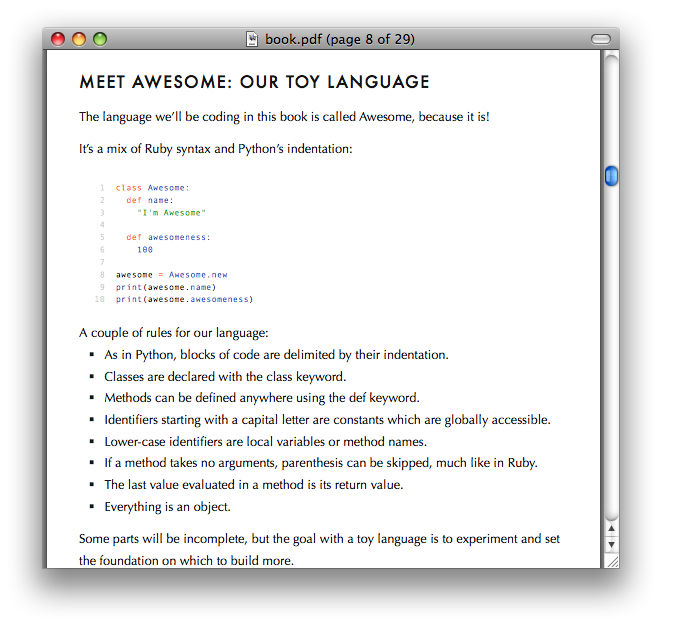 Instead, it should serve as an introduction in building your first toy language. You can find a review over here. 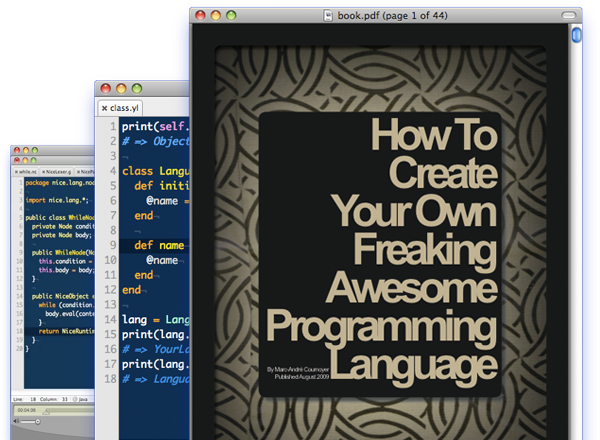 Buy the book “Create your own programming language”here.